On Wednesday, November 9, Archbishop Christophe Pierre, Apostolic Nuncio to the United States and representative of Our Holy Father, Pope Francis presided at the installation Mass for Archbishop Paul D. Etienne at Our Lady of Guadalupe, co-cathedral of the Archdiocese of Anchorage. In attendance were Catholic leaders, dignitaries, family members, and faithful from around the country. Archbishop Etienne replaces Archbishop Schwietz, who has served as archbishop of Anchorage since 2001, and who submitted his resignation in July 2015 upon turning the age of 75. The Archdiocese of Anchorage comprises 138,985 square miles in the state of Alaska. It has a population of 483,346 people of whom 27,345, or 6 percent, are Catholic. Good afternoon! Thank you for coming here to pray with us today!I wish to thank today Archbishop Christophe Pierre, Apostolic Nuncio to the United States and representative of Our Holy Father, Pope Francis. 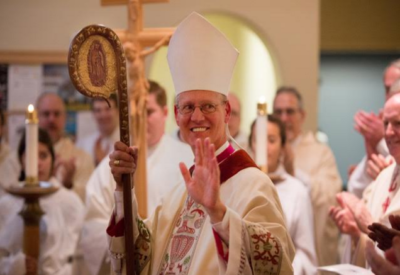 I know you have been travelling quite a bit this week with ordination and installation of other bishops, and we wish to welcome you to Alaska.I wish today also to welcome Archbishop-Emeritus, Roger Schwietz. How do you like the sound of that, Archbishop? You have been a loving shepherd to this local church for sixteen years, and I humbly and gratefully now follow in your footsteps. Thank you, Archbishop, for your years of faithful and loving service to the Archdiocese of Anchorage.Welcome, my brother bishops, priests, deacons, religious, laity, civic and religious leaders of Alaska, to all who are watching by means of internet or TV, and a special welcome to my family and friends, and many of my staff from the Diocese of Cheyenne who made the journey to be with us today. Welcome, one and all. On this Feast of the Dedication of the Lateran Basilica in Rome, the readings today give us two understandings of a temple. Jesus in his zeal for the Father’s house indicates that not only is the earthly worship space worthy of reverence and respect, but equally important is the temple of the human person. When asked for a sign that indicates his authority to cleanse the temple, Jesus exclaims: “destroy this temple and in three days I will raise it up.” The Jews questioning Jesus were talking about the temple. Jesus is talking about the temple that is his own body. St. Paul in the Second Reading today further develops our understanding of the dignity of the human person when he teaches; “Brothers and sisters: You are God’s building … Do you not know that you are the temple of God, and that the Spirit of God dwells in you?” In a world that is increasingly more concerned with ‘things’ rather than persons, our celebration today helps to re-orient us to just how important it is for us as church to rebuild our culture’s understanding of the sacredness of human life. The dignity of the human person is not defined by each person. Nor does anyone else define for another the source and parameters of human dignity. No. Human dignity is rooted in God. Human dignity is defined by the reality that God dwells in us through His Holy Spirit, and that each person of God’s family is redeemed by Jesus Christ. One person’s dignity is no greater than another’s, because in the eyes of God, we are all equal. Because each person is a temple of the Lord, and therefore holy, all violence towards any human person, whether born or unborn, is unacceptable to God. When a new Church is dedicated, it is consecrated with Chrism oil. This consecration sets it aside for sacred use – for worship. With this consecration, the Lord is enshrined, and his name is exalted. Likewise, at Baptism, we are sealed with Holy Chrism. The Lord consecrates every human person by dwelling with each of us. Likewise, we are set aside by God himself to share in the sacred life of the Most Holy Trinity. Likewise, each human person is to be a means of exalting the goodness of God. Now, let’s take a closer look at today’s first reading from the Prophet Ezekiel. After my 48 hour visit to Anchorage for the announcement naming me as your new archbishop, I returned to my home in Indiana for some time with my family. The first morning of my visit home, I went with my parents to our home parish, St. Paul in Tell City to pray and celebrate Mass. Sitting in the Blessed Sacrament Chapel, I was overwhelmed with the grace that has poured forth from that sanctuary into my life; with the grace that has been poured into my life by that faith family. A few days later, the date of this installation was set, and I looked at the readings for today, and was once again ‘surprised’ by God’s Providence to discover this as the first reading. The Prophet Ezekiel speaks volumes today of the grace that flows from the sanctuary to make all things new! My people, if you ever wondered what God’s dream is for us and the Church, this is it! This is not just God’s dream, but it is the theological reality of the Church. The water that flows from the sanctuary in the Prophet’s vision is the grace of God, and the People of God are that life-flowing stream of God’s grace into the world. One of the sad challenges we face today is a tendency on the part of many people to ‘bracket’ life into separate categories. Faith is one of those categories. It is not allowed to permeate all of one’s life. I’m not sure why that is, but I would guess one reason is that it is easier to live in the world if we can compartmentalize faith and morals. It makes it easier personally to live as one chooses, rather than as God wills. It also makes it easier to live in a world of values that are far different than the values of God. Faith is meant to be integrated into every aspect of our lives. Going to Church on Sunday is not meant to be one thing we do in the midst of many other things. No, celebrating our faith and receiving the Sacraments are meant to renew and recharge us for carrying that faith and Jesus Christ into the world. Our celebration today reminds us that a ‘full human life; a life resplendent with dignity’ is a life imbued by God, redeemed by Jesus Christ, and animated by the Holy Spirit! When we fully understand this, then our life, each one of us, become a blessing to others. We become that fresh water that flows into the sea of the world, making it fresh and giving it life. The dignity of our life is enhanced, and our lives bear the good fruit of mercy and understanding; accompanying others waiting for someone to raise them up and acknowledge their dignity as a son or daughter of God. When we live a fully integrated faith-life, our life becomes in the world a healing balm of goodness and a medicine that heals the wounds of division and discord. When we allow Christ to cast out from the temple of our hearts indifference and hatred, then our lives are renewed, we are set free, and we become the metaphorical trees of the Prophet’s vision whose leaves never fade, and whose fruit never fails. My dear friends and family of faith, this is God’s dream, and with God, all things are possible. As your new Archbishop, this is now my dream for our potential and possibility! I am told that Alaska is known for its high tides. That being the case, may the faith and good works of this local Church be the standard of high tides for the Church. Let us become ‘the waters of the river which gladden the city of God,’ making the world around us a dwelling for the Most High.